Women, Family and Community Development Deputy Minister YB Dato’ Hajah Azizah Datuk Seri Panglima Haji Mohd Dun (middle) with YSD Chief Executive Officer Puan Hj. Yatela Zainal Abidin (8th from right) and the BIM-MFD team. Putrajaya, 27 September 2017 – The Malaysian Federation of the Deaf (MFD) in partnership with Yayasan Sime Darby (YSD) launched My Bahasa Isyarat Malaysia (MyBIM) today, a sign language app that uses multiple interactive methods to teach sign language. MyBIM has the most extensive vocabulary compared to other sign language apps in the market, with 36 available categories and about 500 vocabularies ranging from colours and greetings to pronouns and verbs in both Bahasa Malaysia and English. The app demonstrates gestures and includes a step-by-step guide for easy learning, enabling the public to learn sign language via an easy and accessible solution. It also helps to improve the quality of education for the hearing impaired community in Malaysia with interactive learning methods through videos and flashcards which are available in Bahasa Malaysia and English. The event was officiated by Women, Family and Community Development Deputy Minister YB Dato’ Hajah Azizah Datuk Seri Panglima Mohd Dun and attended by MFD advisor YB Tan Sri Datuk Seri Utama Shahrir Abdul Samad, MFD President En. Mohamad Sazali Shaari and YSD Chief Executive Officer Puan Hajjah Yatela Zainal Abidin. YSD Chief Executive Officer Yatela Zainal Abidin said with the development of the app, sign language will be more accessible to the public. “As MyBIM is the very first Malaysian sign language app with extensive vocabulary in the market, YSD is very excited to be a part of this important national initiative. Aside from educational assistance to the hearing impaired community, the Malaysian public now has an easily accessible tool to learn sign language on their own and to communicate with their hearing impaired friends and family. “It is hoped that the launch of this free software app will aid the assimilation of more hearing impaired people in society and ease the challenges they face daily when the communication barrier is addressed, with others also picking up the Malaysian sign language skills,” she said. The app features children from MFD who gesticulate the vocabularies. Coupled with scroll down and search options to choose from, the app also has toggle features including latest news and a gallery section. MFD President Mohamad Sazali Shaari said this is the beginning of a future of inclusiveness for the hearing impaired community. MyBIM is available now on Google Play Store and the Apple App Store. YSD’s support to the MFD began in 2012 and YSD has been supporting MFD’s Independent Living Skills Programme (ILSP) aimed at promoting capacity enhancement for the hearing impaired by providing proper living skills and on-the-job training to sustain their livelihood. MFD was able to assist 100 hearing impaired trainees in the programme who are now working at various companies such as MFD, Panasonic, McDonald’s, Canon, Tesco Puchong and Politeknik Shah Alam. 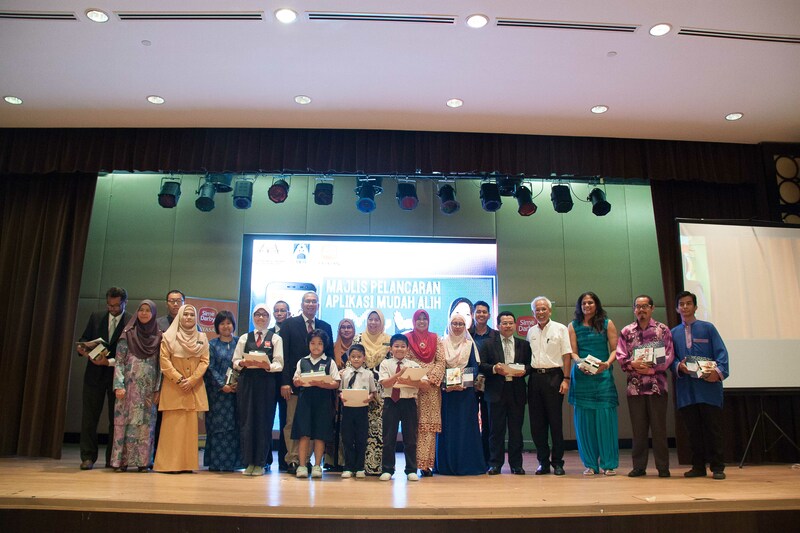 In addition to this, MFD successfully launched four Bahasa Isyarat Malaysia (BIM) books and an interactive CD for hearing impaired children consisting of 5,000 new sign language vocabularies.